We may not think of pumpkins as items having a lot of texture, but these certainly do. They’ve got deep grooves that make them look like old-fashioned pincushions, or those “pouf” things that double as ottomans and chairs. Even the stems are extra thick and long and covered with little bumps and knobs. These pumpkins are not just a visual treat, but also a tactile one. The next time you see a pumpkin display, stop for about 30 seconds, close your eyes, and gently fondle the pumpkins. See how they differ not just by appearance, but also by touch. If you’re with someone else, here’s something to try: close your eyes, have them hand you a pumpkin, feel it for about 30 seconds, give it back to your companion to put back on the display, and THEN open your eyes and see if you can pick out YOUR pumpkin. Challenge your friend to do the same. You can even make a wager on who will pick out “their” pumpkin the fastest. You may get some weird looks, but you may also get some other people to join in the game. Who knows, this could be the start of a new Halloween tradition, like bobbing for apples. Just be nice and don’t hand someone a pumpkin bigger than they can comfortably hold and turn in their hands. RPRT Photo is not responsible for bruised fingers, smashed toes and/or hernias. Or for the mess you make if you accidentally drop a pumpkin on the floor. Of all the “Autumn/Harvest” images I took this year, I think this one gets the prize for the greatest variety in one image. 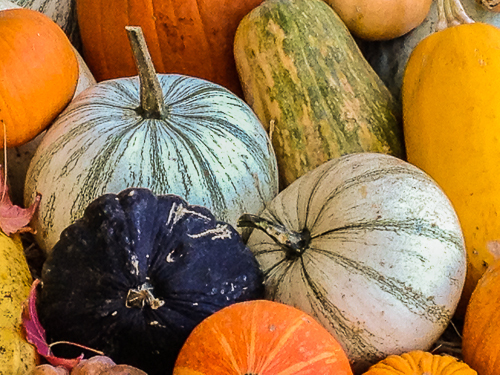 Pumpkins, squashes and gourds galore! If you can’t find one you like, you’re not looking hard enough. It seems like a number of other office and apartment buildings decided to light some of their windows and/or rooftops orange as well. It was great to see the city landmarks “color-coded” and standing out from their surroundings. Just one request: can we leave the orange lights on through Halloween? These Ain’t Your Father’s Pumpkins! Like the Oldsmobile, pumpkins have experienced a metamorphosis in my lifetime. No longer smooth, round and orange, they now come in an overwhelming variety of shapes, colors and textures. Some are elegantly understated, some are bright and gaudy, and some look like they could use the help of a dermatologist…stat! I’m endlessly surprised and delighted by the variety. I love Autumn. Somehow it seems to be the best season for photo ops. Take pumpkins, for example. Seems like every grocery store and produce stand and Farmers’ Market has them on display. And is it my imagination, or are there more and more varieties every year? When I was a kid, pumpkins were orange. Not orange-yellow or orange-red, but just one shade of orange. Period. Fast-forward half a century or so, and now pumpkins seem to come in every color of the rainbow. Variations of red, orange, yellow, green and white have become commonplace. 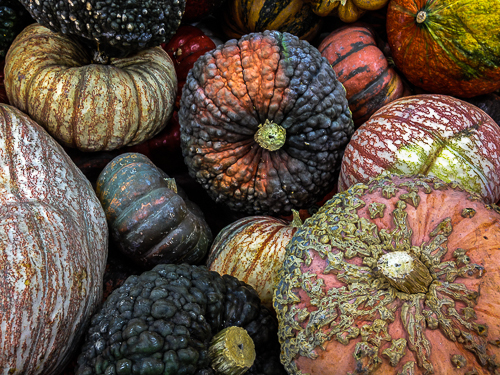 Over the next week, I’ll be sharing some pumpkin and gourd images I took this year. Get out and make your own images before they’re gone. 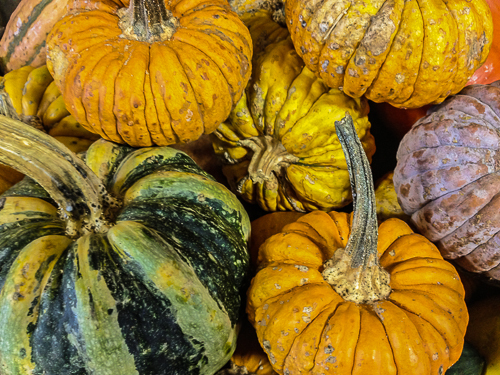 Pumpkins and gourds remain on display and for sale up to Thanksgiving, but it seems like the best variety is found before Halloween. You’ve only got one week left…what’re you waiting for? Last month I spend almost an entire day shooting at a marina in British Columbia. There were interesting boats and birds (including bald eagles!) 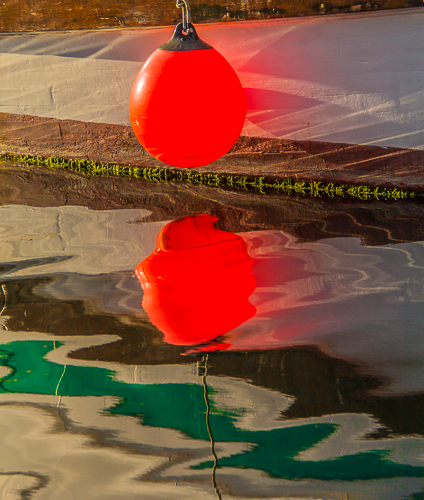 and reflections and even “still lifes” as in yesterday’s post (Rope & Hat 10.23.12). The day ended with a lovely sunset. I kept shooting until there was no light left in the sky whatsoever. If you’ve been with me for a while, you know I love doing silhouettes. This is one of my favorites from that day. 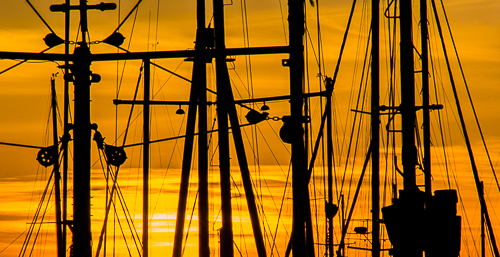 I love all the different sizes and shapes of the masts and rigging. 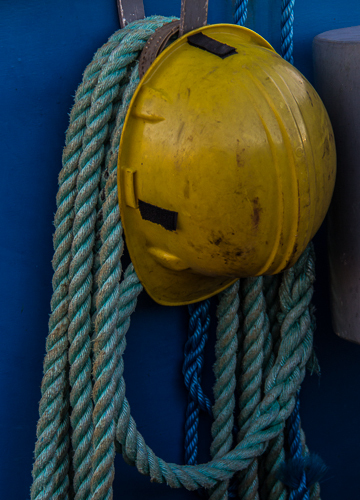 I was shooting at a marina last month and came upon this hard hat and rope hanging on a hook on a boat. I love the different shades of blue, the different textures of the rough, twisted ropes and the smooth plastic hat, and the way the bright yellow hard hat pops. How ‘Bout Those Giants (Again)? I’m proud of the San Francisco Giants tonight, winning their fourth and final game out of seven against the Saint Louis Cardinals, and advancing to the World Series. Being a San Francisco native, I’ve always got to root for the home team. I was able to come up with this one, which features a ball–okay, ball-shaped object, in this case a boat fender–and the color orange, as a sort of photographic tribute to the team (whose colors are orange and black). Hey, my last Giants tribute post (on 06.13.12 to commend Matt Cain’s no-hitter against the Houston Astros) featured orange FLOWERS. So at least with today’s orange sphere I’m…wait for it…in the ballpark. This duck had just jumped out of the lagoon and onto the log. She had been feeding, and was completely soaked from head to toe…er, webbed foot. Something about her expression struck me as cross. I shot her just before sundown. 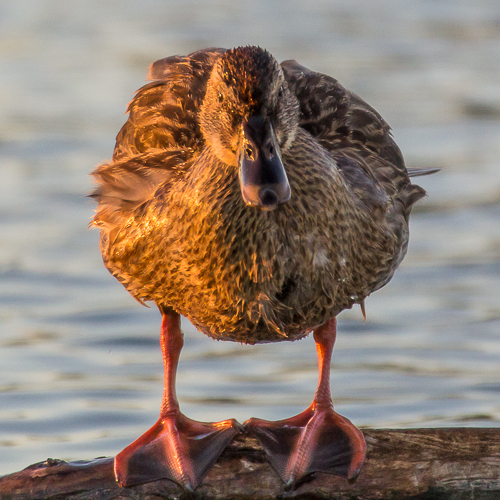 The strong sidelighting adds some drama, and the golden light highlights her brown feathers, and really makes her orange legs and feet stand out.